McDonald's has been contributing to Puerto Rico's economy since 1967. McDonald’s has been contributing to Puerto Rico’s economy since 1967. McDonald’s is marking five decades of presence in Puerto Rico with a new restaurant in Hato Rey, which is creating 70 direct and 40 indirect jobs during construction, company officials said Monday. “This new facility is strategically located adjacent to university institutions and private companies. With this opening, we will contribute to the economic strengthening of the area and offer customers the best of our products, quality, service, cleanliness and value that governs us as a brand and that has distinguished us during these 50 years of presence in the Puerto Rico market,” said Marisol Vega, managing director of Arcos Dorados Puerto Rico, which operates the restaurant chain. 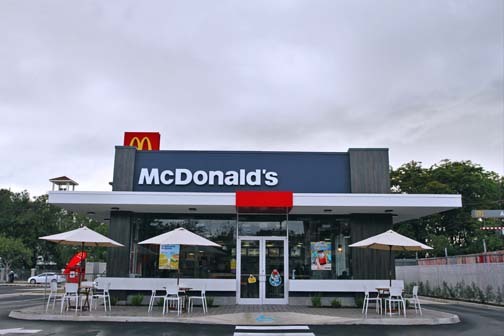 The new restaurant follows the line of modern design that McDonald’s has been incorporating as part of the brand’s image since 2010, called “Blade & Ribbon,” which allows customers to easily identify the brand through an iconic red column and a white band that surrounds the building. The history of McDonald’s in Puerto Rico began in 1967, with the opening of the first restaurant on the island, on 65th Infantry Road in Carolina. This was also the first restaurant in the world opened outside the continental United States. Hey Buddy!, I found this information for you: "McDonald’s marks 50 years in PR with Hato Rey location". Here is the website link: https://newsismybusiness.com/mcdonalds-years-location/. Thank you.